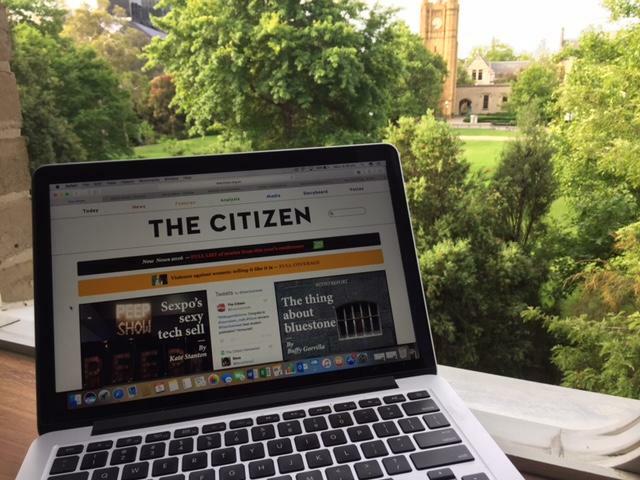 The Citizen has been named best student journalism publication for 2016, landing the Dr Charles Stuart Prize in this year’s Ossie awards. The Ossies are sponsored by the Journalism Education and Research Association of Australia and honour the memory of journalist and war correspondent Osmar S White. The Citizen’sBuffy Gorrilla also won the prize for the best audio story of more than 2 minutes, while Jack Latimore won the inaugural John Newfong Prize for reporting on Indigenous affairs. Gorrilla won for her report ‘Aquafaba: the egg substitute vegans have been waiting for’. A version of the story also played on the Radio National program Blueprint For Living. Liam Clark was highly commended in the same category for his report ‘The Asia-Pacific dreams up its own Eurovision’. Maria Abbatangelo was also highly commended for her investigation into railway platforms gaps following the death of a teenager at Melbourne’s Heyington station. A full list of this year’s Ossie winners can be found here. Winner of best local/community journalism category in the inaugural Our Watch awards (2015) for coverage of violence against women. Also, a finalist in the same category in 2016. Highly commended in the information category of the 2013 Australian and New Zealand Internet Awards (sponsored by auDA and InternetNZ). The judges deemed The Citizen “a great source of publicly spirited journalism with a great presentation of information in a unique visual format”. Bec Zajac named Asia Pacific Journalist of the Year at the Diageo Women’s Empowerment Journalism Awards (2015) in Hong Kong for a series of reports focusing on gender education in schools. Hugh McMaster named finalist in the Melbourne Press Club Student Journalist of the Year (2015)award for his reporting on political donations. Julie Milland short-listed for Melbourne Press ClubStudent Journalist of the Year (2014) for her feature on cancer research. Derrick Kruschenamed runner-up in the Walkley Young Journalist of the Year Awards 2014 (student category). Aliyah Stotyn named Melbourne Press Club Student Journalist of the Year (2013) for her story on a social media mishap. Julie Milland short-listed for Melbourne Press Club Student Journalist of the Year (2013)for her reporting on a mystery virus that was causing paralysis in children. Krati Garg named winner of the Dart Centre forJournalism and Trauma Award for her story on the impact of trauma reporting on correspondents, both in the field and on return. Daryl Holland, Elyas Khan, Keryn Reynolds, Andy Hazel, Ronelle Richards and Scott Tibballs awarded best investigative report for uncovering the influence of a Melbourne property developer on the Victorian branch of political party Family First. Freddy Woodhouse named winner of the Mindframe Award for his report on how PTSD can put veterans’ families at risk. Derrick Kruscheawarded Best Print News Story for his report on new medical advice for treating jelly fish stings that was co-published by the Cairns Post. Rose Iserawarded Best Broadcast News Story for a report on the likely impact on animals at Melbourne Zoo of drilling for the proposed East West tunnel. Bec Zajachighly commended Best Broadcast News Story. Bec Zajachighly commended in Best Use of Convergent Media for a series of reports on domestic violence. Rose Iser, Chris Shearer, Michael Roddan and Bec Zajachighly commendedin the Sally A. White Prize for Investigative Journalism for their reporting on conditions inside the Manus Island detention centre, gleaned from thousands of leaked operational documents. Chris Shearer highly commended in Best Feature Article category for a story about buying drugs online via the “new” silk road. Henry Belot highly commended in Best Feature Article (Online) category for his report on Indonesia’s social media “love affair” leading into the 2014 presidential election campaign. Julie Milland highly commended for Best Online Story for her report on the mystery EV71 virus. Clemmie Wetherall and Wes Mountain highly commended in Best Use of Convergent Media for their report on the push for a rail link between Doncaster and Melbourne.